As the world of social media continues to change, the popularity of hashtags has proven to be less of a trend and more of a necessity. 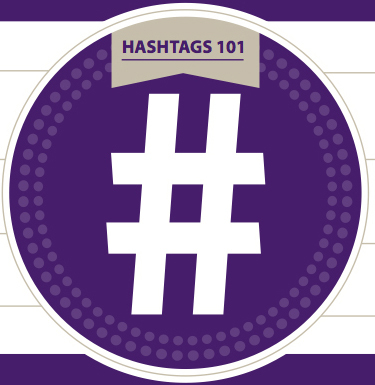 At K-State we are using hashtags to fuel social media marketing campaigns. Social media posts, including hashtags, drives more engagement, curates a story or event and taps into trends. Take your hashtag campaign from average to viral and see our hashtag best practice guide below. 1.) Do your research. Before choosing a hashtag research using a website such as https://www.hashtags.org. Avoid competition and dominate your hashtag by selecting one not in use. 2.) Content is King. You’ve got a great hashtag now what? Make your hashtag stand out with great content. Mix in video, text and image posts. Create informative and quality content that will engage your audience. Be sure to tag appropriate accounts in posts to gain more visibility and possibly garner a retweet from key influencers. 3.) Make it visually appealing. Promote your hashtag by adding the hashtag to photos, graphics, videos or any material you are sharing. This includes any tangible marketing materials such as brochures and fliers. 4.) Less is more. Resist using too many hashtags, it just looks spammy. As a rule of thumb, use only two to three hashtags per post. Research and use related and relevant hashtags. 5.) Make it memorable. Use catchy words that are easy to recall and avoid using personal pronouns. It is best for your hashtag to fit well into a post instead of adding it to the end of a post. Test how the hashtag reads by drafting a few social media posts. 6.) Grammar and spelling count. Watch usage of abbreviations. Capitalization is your friend. It helps with readability. Overall, correct spelling and grammar gives any social media account credibility. 7.) Be consistent. Promote your hashtags across social media channels. Inform other social media account coordinators about promotions and provide information for them to share your campaign message. Consider creating a social media guide including prepared messaging, images and campaign overview. Here’s a great example of a social media guide for World Cancer Day. 8.) Keep it short. Make it your hashtag “Tweetable.” You want people to be able to fit the hashtag into a 140 character tweet. As a rule of thumb, stick to 8-12 characters. Consider making the tweet a call to action. 9.) Monitor the use of the hashtag by using a tool like https://tagboard.com. Tagboard is a great tool because it allows you to block negative posts or accounts using your hashtag. 10.) Curate. Use a hashtag aggregator like https://tagboard.com to encourage people to join the social media conversation and also see their posts displayed. There is a presentation mode to showcase posts during a live event. You can also embed the tag board on to a website. Here’s an example of a tagboard embedded on a website. Hashtags are searchable links on Twitter, Instagram, Facebook, Vine, Google +, Pinterest and YouTube. Hashtags do not work on LinkedIn. Event hashtags are related to a specific event. Ex: #KStateSOU #KStateWOW #KStateOpenHouse. Try not to use a date or year in the hashtag. This way you will be able to use the hashtag in years to come. Campaign Objective: To create an exciting and relevant way for prospective students, K-State colleges, departments and programs to connect and engage in K-State social media while exploring buildings across campus. With the increased popularity of Instagram, the #KStateSelfieChallenge on Instagram will replace the Foursquare Check-In challenge, while promoting the university’s fastest growing social media channel. “Selfie Stations” will be set up at each of the 13 passport locations across campus with signage. From 11:30 a.m. to 2 p.m., participants have the opportunitiy to take a selfie with K-State Celebrities, such as President Kirk Schulz, Dean Pat Bosco and Willie the Wildcat at designated locations to be announced via K-State social media. 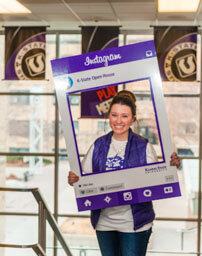 K-State Open House student volunteers will serve as station hosts where celebrities are stationed to greet and encourage attendees to participate and take selfies with K-State-themed Instagram frames. Upload to IG and use hashtag #KStateSelfieChallenge. After visiting designated locations present your passport and or selfies to Open House Staff at the K-State Student Union. Share our Pinterest board for a virtual map of K-State Open House hot spots and selfie stations: http://www.pinterest.com/kansasstate/k-state-open-house/. Share the K-State Open House invitation YouTube video via social media: http://bit.ly/kstateopenhouseinvite. Follow and share posts from K-State social media regarding open house. Remember to use the #KStateOpenHouse hashtag when creating related social media posts. Facebook native video – uploading videos to Facebook itself rather than posting YouTube video links on the social network – is creating viral success for small and huge brands alike. The K-State Facebook page has seen impressive results with increased video views and user engagement using Facebook native video. 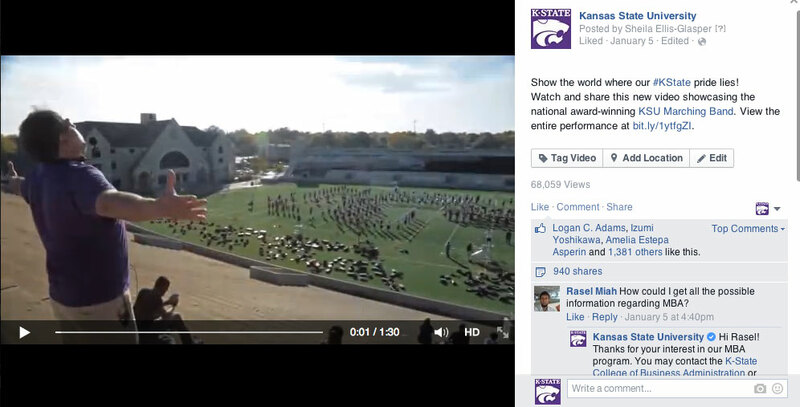 A perfect example is a K-State Marching Band performance posted on the K-State Facebook page on Jan. 5. Within 24 hours, the video topped 50,000 views and reached more than 150,000 Facebook users. The numbers kept climbing and comments, likes and shares hit 5,000 within two days. 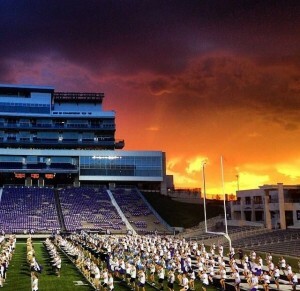 It surely helped that the K-State Marching Band had just won the honor of top university band in the nation. Just another example of why content is key on social media! Above you can see Facebook insights from the same Marching Band video that was posted to Facebook using a YouTube link. The uploaded video received over six times the engagement as the one linked to YouTube. Feature your video. By selecting to feature a video, it is prominently placed above your page’s “About” section and is larger on your videos tab. It’s important to feature a video that is a great representation of your brand. Make video playlists. The more video uploads you post, organizing them will become more important. You can organize your videos by creating multiple playlists to control the user’s experience navigating through videos. Create an engaging video that you personally would share. Be sure to choose a video that is entertaining, informative or inspiring. Interact! Once someone comments on the video, reply back. The more comments on any Facebook post, the higher up it goes on Facebook users timeline. Use the Learn more button on the video. You can use the “Learn More” call to action button to drive someone to a website for more information about the video’s topic. The button shows up in the left-hand corner while the user is watching the video. Looking for a way to engage with students on the university’s Instagram account while creating a fun way to integrate social media into the university’s “Week of Welcome” activities is how the #KStateWOWpix photo challenge was created. Keep reading as we share the challenge from a social media management perspective. At the beginning of each semester, the university hosts a series of events to welcome students to campus. 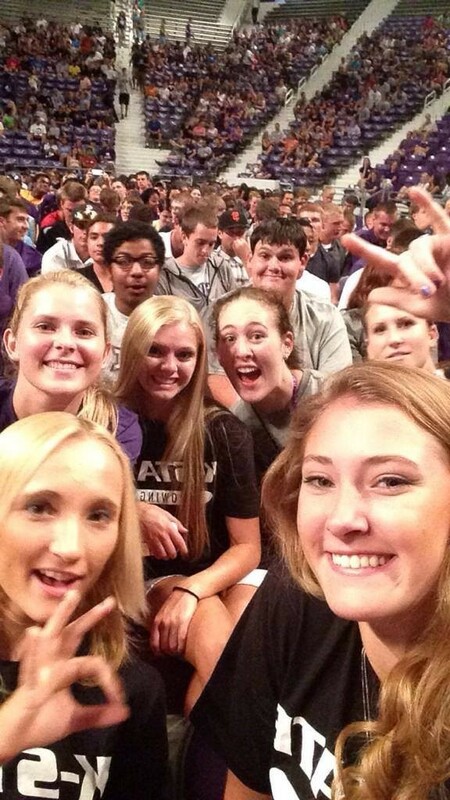 During the Week of Welcome for the Fall 2014 semester, new and returning students were asked to post a photo corresponding to the daily challenge with the hashtag #KStateWOWpix, as well as that day’s assigned hashtag. Any individual who participated on a given day was eligible to win the daily prize of a $50 K-State Student Union gift card. Challenges included selfies displaying the Wildcat hand sign and photos showcasing something they love about K-State, their newly decorated living space, a K-State tradition, their purple gear and a representation of their college, department or future profession. Daily winners were selected by Division of Communications and Marketing staff along with K-State celebrity judges, including K-State President Kirk Schulz, women’s basketball head coach, Jeff Mittie and Student Body President, Reagan Kays. Five of the top photos from each day’s hashtag were sent to the campus celebrity judges for selection of each day’s winner. 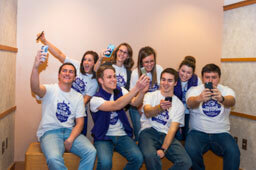 Select photos were also featured on university social media channels and the K-State website. At the conclusion of the week, the six winning daily photos were compiled into a Facebook photo album and fans were asked to “like” their favorite photo. The photo with the most likes was named the grand prize winner and awarded an iPad mini. The photo challenge ran from Sunday, Aug. 24, to Friday, Aug. 29, 2014. 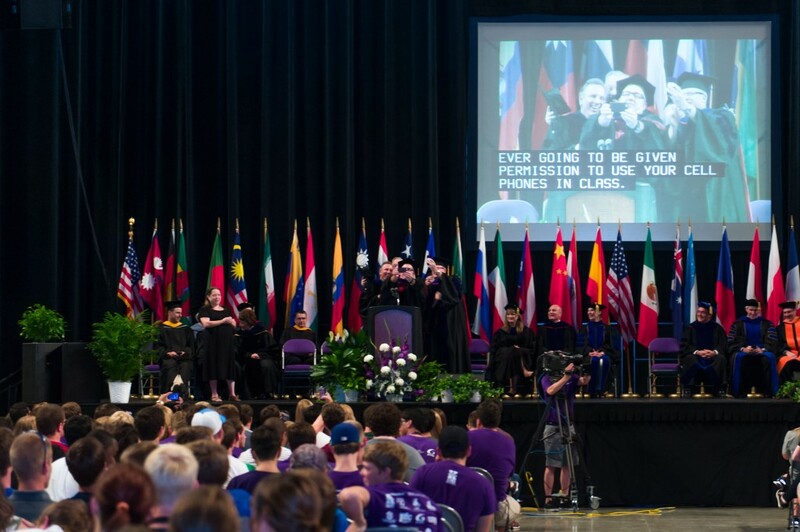 Our university president, Kirk Schulz, kicked off the photo challenge by asking students to participate in the first day of the challenge during the New Student Convocation ceremony. Students appreciate President Schulz’s active social media presence, and the ceremony provided the perfect opportunity for him to promote the photo challenge and to get students excited to participate. During the week of the photo challenge, the university’s Instagram following increased by 600 followers and engagement increased across all social media channels. The challenge allowed students to share their favorite parts of the university and get excited about seeing their photos featured on the official university social media channels earning hundreds of likes. The challenge provided the university with great content to share and the opportunity for genuine interaction with students. The contest involved many aspects of campus including individual academic colleges, housing and dining, athletics and administration. See all of the posts submitted for the challenge via the #KStateWOWpix tagboard.